Apple (Nasdaq: AAPL) kicked off its Worldwide Developers Conference today with a jam-packed keynote that included product announcements for both hardware and software. Here are some interesting facts that got the show started: 400 million iTunes App Store accounts 650,000 apps 225,000 iPad-optimised apps 30 billion app downloads US$5 billion cumulative paid out to developers That last point is important, because just two quarters ago Apple had only paid out US$4 billion, meaning the app business is accelerating dramatically and that cumulative figure has grown 25% in just six months. It also implies that Apple’s cut has been a little more than US$2.1 billion…. Apple (Nasdaq: AAPL) kicked off its Worldwide Developers Conference today with a jam-packed keynote that included product announcements for both hardware and software. That last point is important, because just two quarters ago Apple had only paid out US$4 billion, meaning the app business is accelerating dramatically and that cumulative figure has grown 25% in just six months. It also implies that Apple’s cut has been a little more than US$2.1 billion. Apple updated the specs throughout its notebook lineup, including the traditional MacBook Pro family and MacBook Airs. Intel‘s (Nasdaq: INTC) latest Ivy Bridge chips and NVIDIA‘s (Nasdaq: NVDA) newest Kepler chips are featured throughout (or when a discrete GPU is used, in NVIDIA’s case). No shockers there, as the inclusion of these chips was practically guaranteed. Advanced Micro Devices is relinquishing its graphics spot back to NVIDIA. Apple is also upgrading to USB 3, which offers faster transfer speeds than the current USB 2. The biggest hardware announcement today was a new generation of MacBook Pro. Most of the details of this new laptop were pretty much in line with expectations, with no major surprises up Apple’s sleeve. That doesn’t take away from their significance, though. 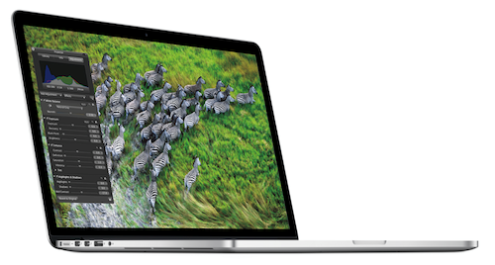 It only comes as a 15-inch model (for now) that sports a high-resolution Retina display with 2880 x 1800 resolution. That chalks in at a lower pixel density than Apple’s other Retina displays on its mobile gadgets, but it’s still the highest-resolution display for a PC ever. MacBook Pro with Retina display. Source: Apple. Expectedly taking some design cues from the MacBook Air, it ditches the optical DVD drive in addition to traditional hard disk drives, or HDDs, in favour of solid-state drives, or SSDs. Doing so has allowed Apple to make the notebook even thinner than before. Apple is the only computer maker that’s devoted the R&D dollars and time into pushing the envelope. It uses custom parts for the guts of its notebooks, which allows it to take its engineering to a level that OEMs with smaller margins aren’t willing to follow — or are even capable of following. The software announcements are split between Apple’s desktop OS X and mobile iOS. Apple now has a Mac installed base of 66 million users, which is pretty minuscule in a global context. I actually see that as a sign of how much room the Mac has to grow. The latest version of OS X, Lion, has sold 26 million copies, representing 40% penetration within nine months. It took 27 months for Microsoft Windows 7 to reach that level, although that’s certainly a much larger installed base to penetrate. Most of OS X Mountain Lion’s features were previewed several months ago, and there weren’t really any new jaw-dropping additions to show off. Apple is adding voice dictation and a new feature called Power Nap that updates and backs up your computer while it’s sleeping. The OS will also continue getting more features taken from iOS — such as AirPlay mirroring, Game Centre, and Notification Centre. The operating system will be released next month for just US$20. iOS chief Scott Forstall took the stage for all things mobile, mentioning that Apple has sold a cumulative total of 365 million iOS devices. By my count, that includes 218 million iPhones and 67 million iPads. Siri is getting a handful of upgrades, including the ability to fetch sports scores and information, as was suspected. It’s also getting integration with OpenTable and Time Warner‘s Rotten Tomatoes. Siri will be able to launch apps and is getting Twitter integration. Also as rumoured, Apple is bringing Siri to the new iPad. This is all good news for Nuance Communications, as its relationship with Apple continues to expand when you think of Siri and dictation spreading throughout its devices. You can now also FaceTime directly over cell networks, which makes you wonder how Apple ever talked carrier partners into signing off on that considering how much it might strain their networks. iOS is also getting a feature called Do Not Disturb and Shared Photo Streams. A new feature called Passbook looks relatively minor at first — keeping track of all your boarding passes, tickets, and gift cards — but also represents how the iPhone is one step closer to becoming your wallet. Facebook (Nasdaq: FB) is now getting integrated into iOS 6, much like Twitter was integrated last year. The social network will tie into the App Store, calendars, contacts, and everywhere else you’d expect. Is there a map for that? Apple unveiled its new in-house maps offering, displacing Google‘s (Nasdaq: GOOG) long-held seat. The offering plays catch-up in some ways with Android’s map capabilities, adding features like turn-by-turn directions and adding small 3-D models onto maps. The real new feature is dubbed “Flyover,” creating incredibly detailed 3-D models of cities around the world rendered in real time. The models look very similar to what Google showed off last week at its own dedicated mapping event. My biggest concern for Apple was whether it could compile a database of local business listings sufficient to replace Google’s. Forstall said Apple now has 100 million business listings and is even building its own traffic service. iOS 6 will see a release later in the year, likely coinciding with the sixth-generation iPhone. There were rumours that didn’t pan out, of Apple updating more of its Mac lineup, most notably including the aging Mac Pro. That said, I don’t think anyone will come away from the news as “disappointed.” The new MacBook Pros are the most important updates, in my mind, while the software announcements are simply continued evolution and convergence.